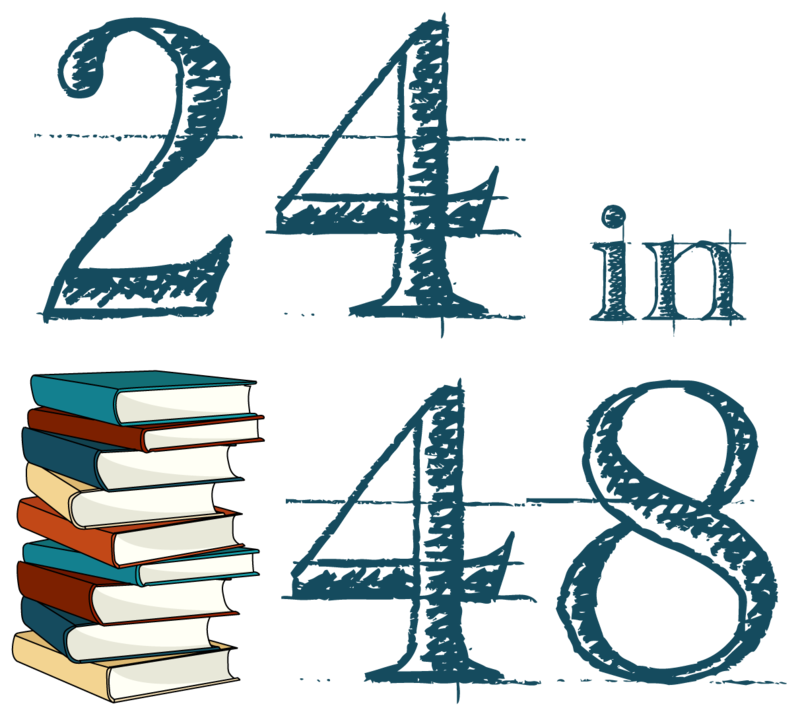 Every few rounds of 24in48, we update our How To Readathon: #24in48 Style post. But since we did that this past July, this year we wanted to do something different. We talked to some of our bookternet friends, and asked them what they love about 24in48, how they approach the weekend, and if they had any unique advice, tips, or experiences they wanted to share. They delivered and then some, so whether this is your first time or your tenth (this has been going since 2012, y’all, wut), be sure to check out what your fellow readers have to say. At the end of this post, we also round things out with some specific tried and true book recs for your readathon stack from your #24in48 cohosts. You can download a PDF of our recs here! Don’t forget: You can find our how to post here, FAQs here, sign-ups here, and participant list here! Don’t be afraid to DM us on social media or send us an email at 24in48readathonofficial [at] gmail [dot] com if you have any questions you can’t find the answer to! 24in48 is definitely a classic example of it’s about the journey not the destination. It’s not about how long you read or how much you read. It’s about setting aside time to do one activity you really enjoy and making it as simple or extravagant as you wish. You can read in bed for 4 hours or make it to 24 with a million snacks, and tracking systems while ensconced in your coziest chair. As someone who participates time again the best advice I have to offer is to read in blocks of time, have some breaks for eating and napping, stay updated on social media for prizes and other peoples updates and have lots of snacks and drinks on hand. Lastly, make sure your family knows what you’re up to and knows to give you space as needed. Pick some books you’ve been meaning to read, find a cozy spot and happy reading! Pick out an over-ambitious TBR “stack” (digital and paper and audio formats included): Choose a wide variety of lengths, formats, and genres—this narrows your actual TBR list and prevents aimless meandering around your house wondering about to “read next.” You can even start by knocking off books you have already started (finishing a book right away is a great boost to the start of Readathon). And don’t forget books that aren’t usually considered Readathon fodder like big poetry collections, classroom reading/textbooks, etc. – all reading counts in a Readathon. Have your favorite junk food at hand, if you like, but don’t forget to have a balanced meal, too: 24in48 isn’t a good time to gorge yourself on junk just because READATHON OMG or try out those new lobster-cheddar balls in the freezer case at the grocery store (trust me, both of those things lead to 2am indigestion regrets). Pick up some trail mix with dried fruit so you can have a snacky/crunchy good time to mix with your favorite candy. Have water standing by as well because as much as many of us are COFFEE DEATH BEFORE DECAF FIGHT ME, hydrating does help with the late-Readathon bleahs. A little advance prep for a stew in the CrockPot or a lasagna in the oven also helps cut down on aimless wandering at mealtime (this time in the kitchen, haha). Don’t sweat errands/chores, etc. because it’s 24in48: you’ve got 48 hours to play with here, but if you are out and about for periods of time (the kids have a soccer match, or you have to take the car to the mechanic, or do the grocery shopping, etc.) bring along a kicky book (or two) or fire up an audiobook on your phone or tablet (I’m extremely partial to my library’s Overdrive/Libby collection). Audiobooks also make great road companions if you have to drive around for a while and if the kids are in the car, or if the grownups can’t agree on what to listen to, a children’s book like Matilda or the Lemoncello series can keep everyone entertained for hours. And, like I said, all reading counts in a Readathon. The 24 in 48 is my very favourite readathon (you always have a special place in your heart for your first, right?) I have never made the full 24 hours (I made it to 19 once which I was totally stoked about). For me the readathon experience is about getting a bunch of reading done, and however much that is is great. Have lots of choices available. You will want to feel like you are getting somewhere, so if you have some poetry, novellas and graphic novels on your TBR, now is a great time to tackle them. This will also help keep your attention when you’re feeling tired. Audiobooks are also great for when your eyes get tired or if you have to do chores. Leave the Odyssey and Don Quixote fo another time – you will thank me. Don’t be afraid to nap! Don’t keep dragging yourself on if you need match sticks for your eyelids! Sleep at night and nap during the day if you need to – it will help you concentrate. Check in on social media. The blog has 3 hourly check ins, which is s nice time to give yourself a bit of a break and see how others are going. Plus there are prizes! Last but not least – have fun! That’s the whole point right? I’ve been most successful by choosing a stack of short (under 200 pages) books to have on hand, as well as a regular length engrossing audiobook. Every time I need to get up to do something, I put in my headphones and switch to the audiobook. This allows for almost continuous reading. The stack of books helps because then I can just grab whichever one looks good next instead of having to go choose from a larger selection. Having shorter books allows for a feeling of accomplishment throughout the weekend. Finishing a book every few hours motivates me to keep going! My very first readathon I had no snacks or really any food in my house. This was a mistake. You have to have some snacks or meals planned out or at least some easy finger food like a sandwich. I tried to eat ramen my first one readathon and it was Not Good. (Picture a book with broth on it. Sad day indeed). Also I tried to read and cook at the same time and I tripped over my cat. True story. Preparing a Book Stack and Sharing it with Your Friends is Fun! I actually really enjoy this part even though I haven’t had a chance to create my stack until this evening. For me, it’s the dream of books I could get done this weekend, but don’t feel like you have to stick to it if something on your bookcase appeals to you after a really intense book. I also recommend that you have a few shorter books and/or graphic novels included. Sometimes, that’s a perfect break from novel-reading that can get you across the 24 hour mark. I’m not even going to write up a whole preamble here, folks, because… IT’S SWAG TIME. We’ve set up our teepublic shop, which is full of shirts and mugs and stickers and totes; all the 24in48 merch your heart desires! We commissioned two “My weekend is all booked” designs, and also have some shiny new logo merch available! You can find our storefront here, and click around by way of desired merch (e.g., click mugs if that’s what your heart desires, crewneck sweatshirts if you wanna be cozy, or onesies if you have a tiny reader spending the weekend with you). We’re SO EXCITED to share this with y’all; you know what to do. Get your ‘thon swag on. Hello, dearest reader friends! We are ONE WEEK out from the next 24in48 Readathon, and we can’t. freaking. wait. As we get closer to the main event, we wanted to be sure to give you all an updated, condensed version of our “How to Readathon” Guide (you can find the original version here and the January 2018 version here if you’re into archives of stuff). The 24in48 Readathon has grown every year, and we’re excited to welcome over (as of this writing) 1,000 readers for July 2018 (will we break 2,000 readers? We think so, but help us get there by spreading the word to all your reader friends!) More participants means more prizes, more ways to participate, more platforms to engage with us (and other readers) on, and more questions! So we’re doing our best to lay out answers to questions that are a bit more nuanced than the FAQs (though if you’re new to 24in48 and looking for some basics, be sure to check those out!). So whether this is your 10th readathon or your 1st, take a spin through the how-tos, what’s-whats, and where’s-thats below. If there’s anything we’ve missed, drop us a line on any one of our social channels or shoot us an email! Every ‘thon, we have a few people who don’t sign up because they don’t think they can make it the full 24 hours. It’s perfectly ok if you can’t hit 24 hours! You should sign up anyway! You will only be eligible for door prizes and challenge prizes if you are signed up. And there’s no punishment for not making it the full 24 hours. Sign up for emails using the Follow button in the bottom right corner of the blog, which will push an email to you every time a new post is published here. New this year! Behind the scenes, your co-hosts have made every effort to be intentional about diversity in this event, from prizes to book stacks to increased engagement with international participants (more on this decision, and what it means, here). While participants are encouraged to read whatever books they want during the event, we hope you’ll consider diversity when picking your own 24in48 TBR stacks. New this year! We want to know what you all are reading! We love stats, and want to collect some about the many, many, many books read during this 48-hour window. We’ll have a “Books Read” form live during the weekend and for the week or so after the event for participants to log the books they read during the event. New this year! Follow us on Goodreads to see what your co-hosts are reading, look for book recommendations if you find yourself in a ‘thon slump, or want to view the results of that “Books Read” form we mentioned above! We’ll be collecting them all here. Every time you start reading hit start and pause when you stop to take a break. Simple! It doesn’t have to be exact, but because this is on the honor system don’t abuse the clock (no letting it run while you nap, pals). Challenges: every six hours (Hours 6, 12, 18, 24…), you’ll have the opportunity to do a fun little task (usually photo-based) to be entered for a prize. Last time around, we switched things up a little and had y’all submit your challenge entry through an embedded Google Form in the challenge post, rather than comment on the post itself. That worked well on all sides, so we’re bringing it back going forward! For Instagram: Your post should have a three-dot menu at the top right. Select that, then “share”. From there, it should give you an option to “copy link”. Your account must be public (or the @24in48 insta account needs to be following you already) in order to enter. If you don’t dig social media, you’ll have the option to enter the challenges with a line of text as your entry (where it makes sense with the challenge theme) in place of a link to a social post. I hope this helps as you’re prepping for the ‘thon. If you have any follow-up or additional questions, leave ’em in the comments below or reach out on any of our social channels and we’ll get back to you ASAP. Got questions about the 24in48 Readathon? Go check out the updated 24in48 FAQ page! We’ve tried to cover as many of the basics as we can there, but if we’ve missed something, feel free to drop us a question in the comments here, shoot us an email, or find us on any of our social channels and we’ll get back to you ASAP (Twitter is probably fastest, if your question is pressing). And stay tuned for a more in-depth and completely up-to-date version of the How to Readathon post coming later this week, which will include instructions for challenges, prizes, sign-ups, you name it. Still haven’t signed up? Why on earth not? Get thee to the July 2018 24in48 Sign Up Form and join us! We’re just over a week away from the start of the next ‘thon, and there are already over 1,000 readers participating. We are blown away by the love in this community, and can’t wait to spend a weekend reading with you.